We would like to extend a sincere "thank you" to each and every individual - over 175 System i development professionals in total! - who joined us in Minneapolis October 2-4 and helped us make the second RPG & DB2 Summit a huge success. Judging by everyone's feedback, we all left Minneapolis jazzed up, bursting with new ideas, and ready to apply what we learned to our projects. Every time we spend a few days with folks like you, we learn a lot. We truly appreciate the ideas you shared with us throughout the week. And that's what the Summit is all about - learning from each other, inspiring one another to try new techniques to improve effectiveness or productivity, and having a whole bunch of fun in the process. 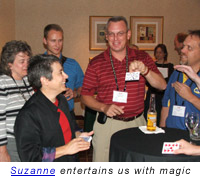 Speaking of fun, we hope you enjoyed playing Wii, socializing Tuesday evening at the reception and dinner, being entertained by one of our favorite magicians, Suzanne, and having the opportunity to really get to know each other during our shared meals and Aaron Bartell's Wednesday evening roundtable on WDSC. We lost track of Paul Tuohy after the conference. We suspect he may still be at the Summit Brewery. A special thanks to George Farr for giving us all a sneak peek into the RPG enhancements slated for i5/OS V6R1, and an even bigger "thank you" to Barbara Morris, who actually did all that work! (Hmmmm . . . we wonder if Barbara wrote that formatting wizard over the weekend, like George said she would?) George and Barbara, many attendees made it a point to tell us how much they appreciated having you solicit our ideas and opinions on future enhancements, and making yourselves available for one-on-one discussions. Thanks! We're already working on plans for the next Summit, which will be held in the spring of 2008 in Orlando. Make sure you're on our Email Alert list if you want to get all of the details as soon as they're available. In the meantime, check out the photo gallery from this past event, compliments of photographers Peter Johnson of South Central College and Skip Marchesani. Several of you said your organization may need additional help moving to WDSC, learning how to best architect new applications, or implementing other special projects. If you think System i Developer's Services may help, just contact us and we can help you determine if any of our services are right for your situation.